Joggers know all too well how much wear and tear that the impact of countless road miles can have on the knees. And that is why, so many current cyclists are former runners, who are after a low impact, cardio intensive routine. Unfortunately, an immediate switch to an exercise bike will not necessarily solve the problem. The trouble many (those who haven’t performed any in-depth research) run into, is that upright exercise bikes, while qualifying as lower impact than running, can still prove stressful to already damaged knees. Recumbent bikes have proven, time and again, that they can reduce joint pain and soreness while still allowing committed cardio enthusiasts to achieve the type of workout they have longed for, ever since their knees first betrayed them. For those in this category, the Exerpeutic 900XL Extended Capacity Recumbent Bike with Pulse represents a genuine attempt at providing this type of workout. The Exerpeutic 900XL Extended Capacity Recumbent Bike with Pulse comes equipped with a “Smooth Torque” cranking system coupled with a precision balanced flywheel and v-belt drive that combine to provide a truly seamless pedaling experience. The cycling performance of this machine is completely and utterly devoid of any of those sudden jerks or unwanted vibrations that can be associated with lower-quality machines. High caliber features do not stop there, however, as the 900XL presents an advantageous 8 level adjustable magnetic resistance mechanism that prevents your muscles from ever becoming inured to any one setting, thereby reducing the likelihood of reaching a plateau. With built-in transport wheels on the 42″ x 22″ x 10″ frame that weighs only 70 pounds, the 900XL is as ready to move as you are. The flat design is paired with an extra wide seat and backrest to maximize user comfort. Wide berth leg stabilizers work to eliminate side to side movement while in operation, and also help to reduce the possibility of a tip over. Another safety feature is the broad pedals alongside safety straps that seek to prevent foot slippage. For user convenience, a large LCD monitor displays the calories you’ve burned, the elapsed time of your workout, your rate of speed, and the overall distance you have traveled, and all the while hand pulse monitors continually track your heart rate to keep you in the ideal calorie-burning zone. To adjust the seat, it must be unscrewed from the bottom, moved, then re-tightened. With multiple users, this could be a pain. 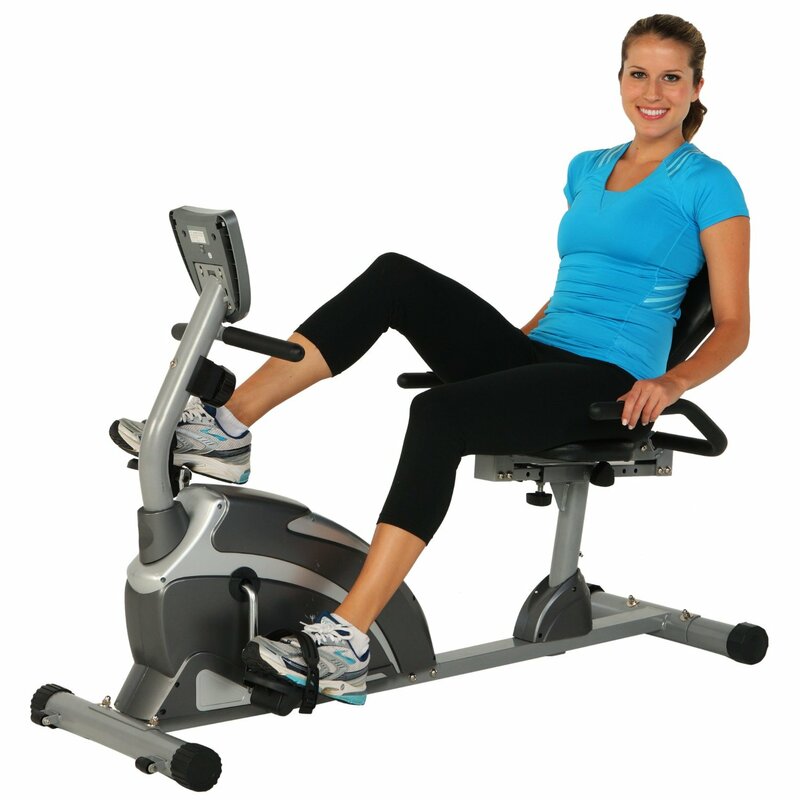 Recumbent bikes put you in a near reclining position that is easy on the spine, knees, and other joints. Yet this seemingly relaxed position still allows for a quality workout while catching up on work via a laptop or a tablet, provided you have invested in some holder or over-bed table such. For the multitaskers who don’t believe in the wisdom of the phrase, “One thing at a time,” an additional item like this would prove invaluable. For those with chronic knee pain, arthritis, back trouble, or some other ailment that renders riding an upright exercise bike more of a challenge than a benefit, we’ve found in our Exerpeutic 900XL Extended Capacity Recumbent Bike with Pulse review that it provides a magnificent way to stay active. Those without such maladies should not be put off, however, as the 900XL was not made to coddle anyone. The adjustable resistance settings provide challenging workouts for users of all levels while the other amenities included should satisfy those who seek a little more tech in their gear. With a three year limited warranty offered on a machine that is already bargain priced, the Exerpeutic 900XL Extended Capacity Recumbent Bike with Pulse presents little consumer risk. And, as is shown in these customer reviews- offers a simple functionality that places it in the running for an overall best value of any recumbent bike currently on the market.